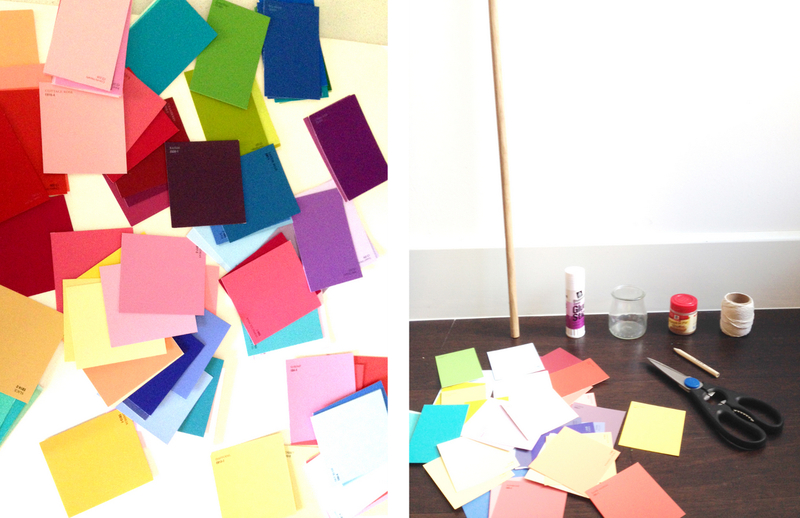 I’m constantly thinking of new colors to paint our walls. Over the years, I’ve collected a ton of paint sample cards. And over the years, I’ve kept a lot of them simply because they’re too pretty to toss out. Thank goodness for that! This DIY took a little time, but I still consider it easy compared to a lot of projects out there. 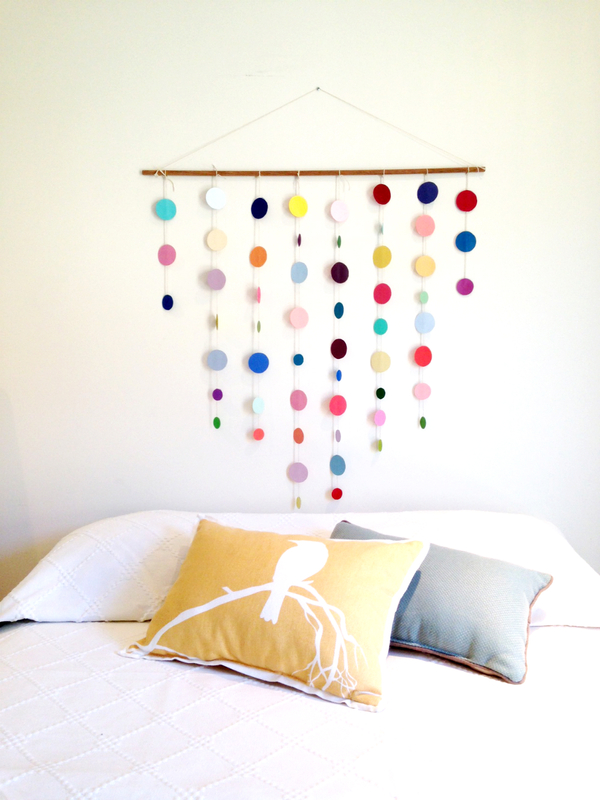 It’s also multi-functional: use it as a mobile, wall hanging, bed headboard (perfect for a kiddo’s room)…the sky’s the colorful limit here. 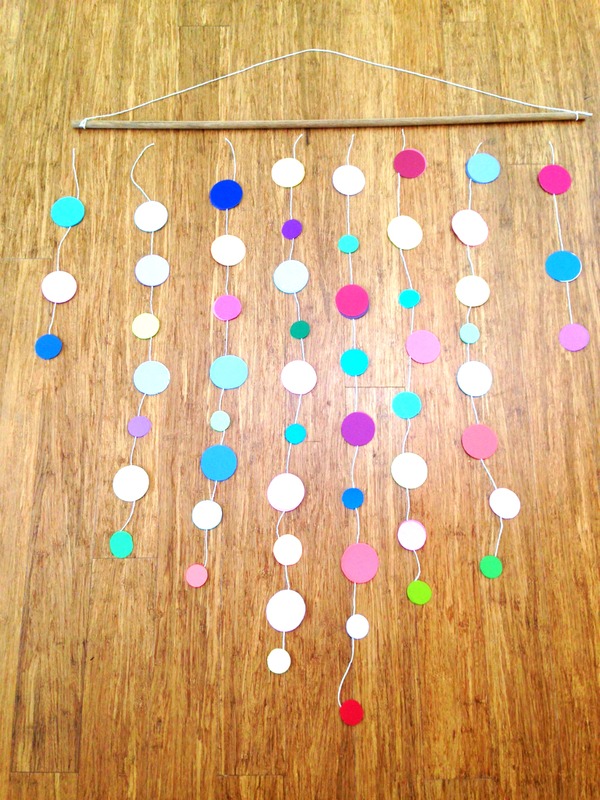 Since I have a thing for confetti (I blame Oh Joy!, designlovefest, and a host of other bloggers) and already have the required materials from my other projects, I decided on a wall hanging. You heard me right. We may be running out of wall space, but I will never run out of ideas. 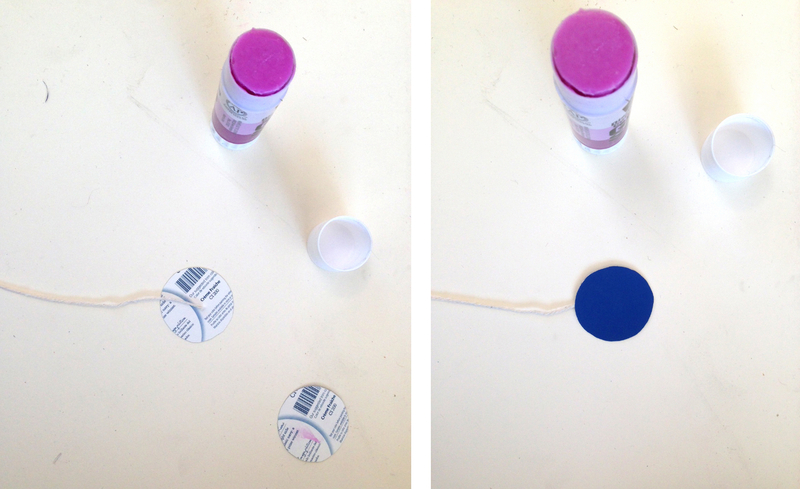 Use your pencil and jar or circular object to trace a circle on your paint chip. Cut out the circles. Repeat for like ever. Cut your twine – the length and number of strands are up to you. I used 8 strands of varying lengths. I paired my paint chips to go back to back so that the wall hanging is reversible. It’s time to get cozy with your glue stick! With the right side down, glue the wrong side of the first circle. Place the tip of your twine on the chip, close to the middle for security. Glue that matching chip on the wrong side and place it on top of its partner. Press down. You’ll probably notice that some of the pairs don’t line up perfectly and the white will show a little around the edges. Use your scissors to trim. Keep gluing the chips to the string, then tie the string to the dowel. Space out the strands to that they are equidistant from each other. Estimated time: all friggin’ night. Just kidding. Cutting the circles takes the longest. It took me about 2 hours. I would say it took a total of 3 hours. I have a confetti to make: I didn’t feel bad about taking those paint chips. It’s all in the name of creativity, craft, and craziness. Criminy! Um…..I freaking LOVE this idea!! 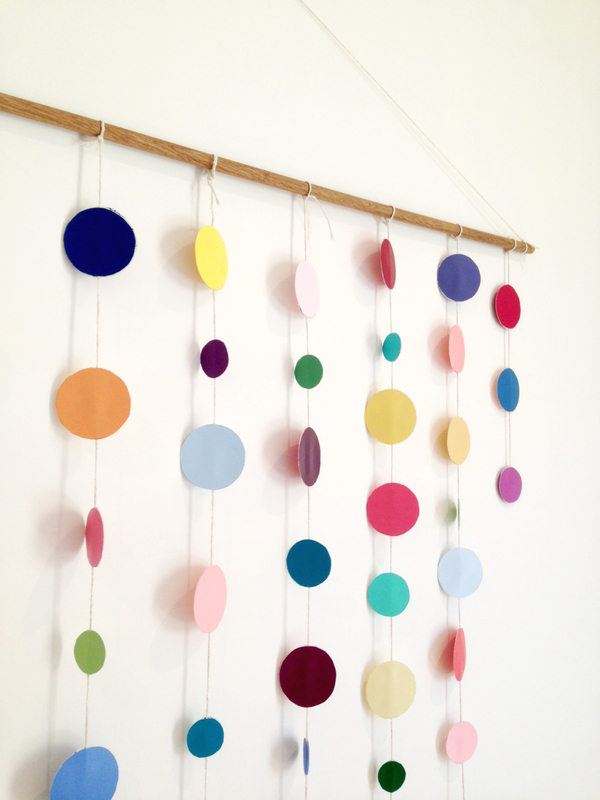 Would make a fab baby mobile too….my head is spinning with ideas. Thanks for sharing! 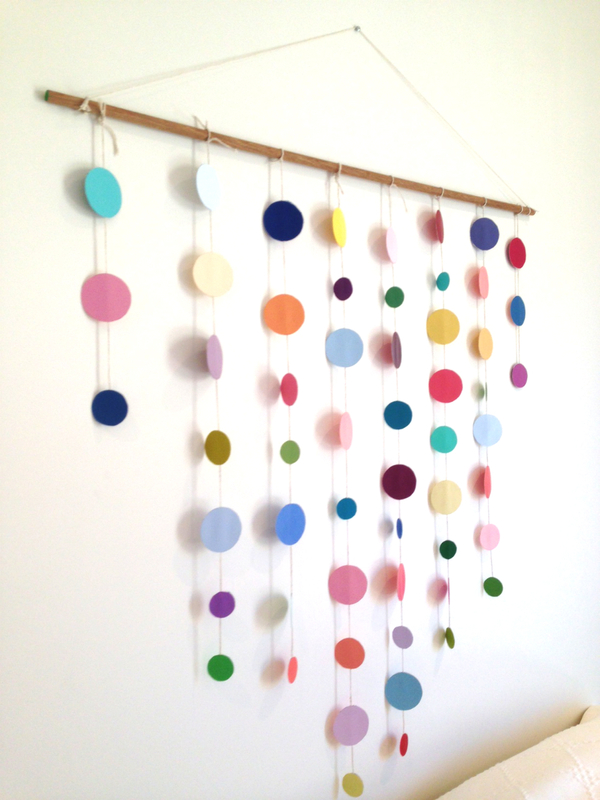 Definitely cute for a baby room!!!! Let me know when your little one arrives!! 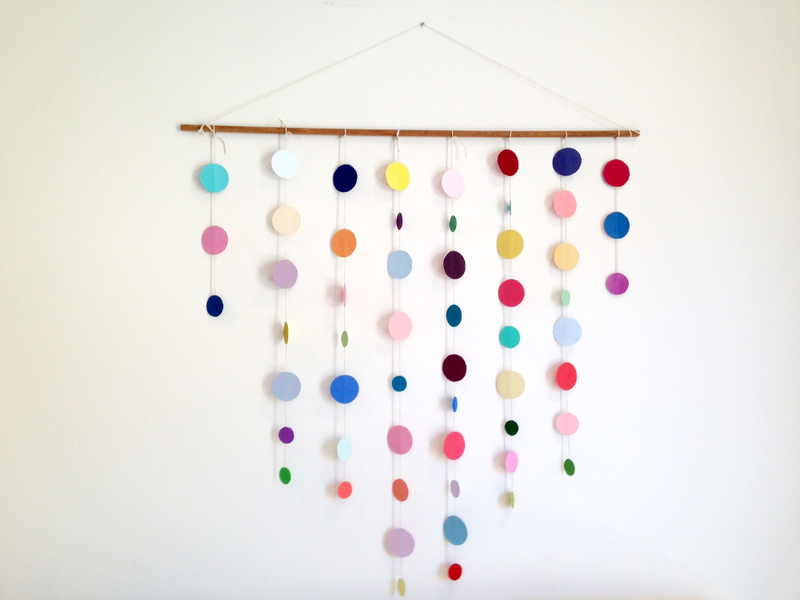 Your DIY projects are so simple I couldn’t help and nominate you for the Liebster Award. Go to http://crafteaheart.com/2014/05/30/s-u-r-p-r-i-s-e-d/ for more details on how to accept your award. Cheers to simple DIY projects! This is fab. I totally see it glammed up with a little gold! Great diy! Thank you! I can definitely see it blinged up with some gold paint (like diagonally painting half of each circle in gold).